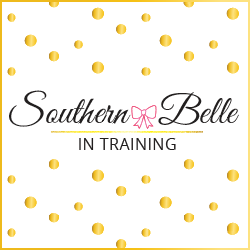 One of the most popular blog posts on Southern Belle in Training (of all time) was one that I wrote almost three years ago, entitled "A Christian Perspective on Tinder." I had been on Tinder and Bumble for a few months at that point, and just thought it would make a good blog post topic to share some of my thoughts about dating and faith. I had NO idea how much that post would resound with people! (True story: I still get emails from people who found my blog from that post.) My story with dating app usage and how I view them in general has changed a lot since I wrote that blog post. 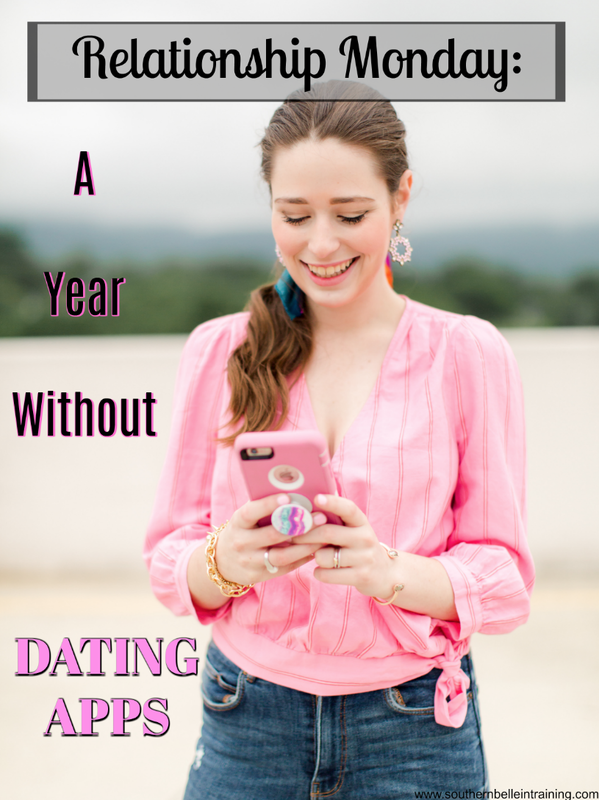 Partly because this year I've finally become happy with being single, and partly because I've had a lot of time to analyze the negatives and positives of my dating app experiences. so in today's Relationship Monday I'll be sharing what life has been like since I deleted all dating apps off my phone last year! Last fall right around this time, I had yet another few dates with someone from a dating app turn into... absolutely nothing. After deciding that I didn't want to continue seeing this specific guy, I thought long and hard about how meeting guys from dating apps usually ended for me. I'm the type of person that doesn't like to chat with someone on an app for more than a few days- if there's any hint of a connection there, I'd like to meet in person sooner rather than later to hash it out. Sometimes the first dates were terrible, sometimes they were pretty good and I wanted a second date. But by date two or three with a guy from an app, I realized a pattern of things usually starting to fade, just like it had with this most recent guy in Vermont! Why did I try dating apps in the first place? Good question! I always thought that I'd be in a really serious relationship by my junior or senior year of college, and when senior year arrived and I was still single as could be, I started thinking about other ways that I could meet guys, besides just on campus (of my very small college). I had heard a lot of gross stories about sleazy guys on apps, but I held onto the benefit of the doubt that maybe a nice Christian guy who also hadn't had much luck dating lately might be looking for a serious girlfriend. Spoiler alert: while I did find some Christian guys on apps over the couple years I used them, I never found anyone that I wanted to be serious with, usually just from a lack of chemistry. I came to realize eventually that chemistry can be pretty tough to find from a few pictures and a few lines of a bio on an app. Anyways, here are a bunch of random thoughts and reflections from my year going app-free! *Less time on my phone: Let's be honest: We live in a technology addicted world. As a radio personality and blogger, I'm already on my phone a lot. I really didn't need to add anything into the mix to keep me on my phone anymore, but alas, dating apps entered my personal world in my senior year of college! They truly have an addictive feel about them. As you're swipe, swipe, swiping away through literally hundreds of people, it's easy to convince yourself that Mr. Right is still on there, and you just have to keep on swiping to find him. Dating apps were so addictive that at times, I found myself trying to check them at work or school. Since I deleted apps a year ago, I definitely spend less time on my phone, which is good! *Not as anxious: If you've used dating apps before or currently use them, would you agree with me when I say that they're anxiety inducing? First the constant need to always check and be on your phone. Then when you do have a match, the anxiety over if they will keep writing to your or if they'll end up ghosting. And then if you're able to make plans, there is first date anxiety... eek! Meeting someone from online, you're never 100% sure if they are who they say they are until you've met. If the first date goes well, then comes anxiety about if you should stop talking to other people on the apps or when to delete them, or if they have done the same. SO MUCH ANXIETY! In fairness, dating itself in any context (whether you met on an app or not) brings at least some anxiety. But I'd rather have any dating-related anxiety in my life be normal and natural, not the excess stress that app usage brings. *Easier to find contentment in singleness: In my previous Relationship Monday post, I wrote about how 2018 has been a turning point for me in being content with this season of singleness. Deleting dating apps I am certain has been a big part of the change in mindset! Swiping away and messaging an endless amount of people is the perfect way to remind yourself to believe that you need a a significant other to be happy. I spent pretty much my whole college years pretending that I was happy as a single girl, but being jealous and insecure about it on the inside, and dating apps just perpetuated those feelings. You can read more in the other post that I wrote, but this year I know that I trust 100% in God's plan for my love life, and I've also come to enjoy a lot of the things that come with being a single adult! *Finding healthier coping mechanisms: I used to spend more time on dating apps over the last couple years at times when life wasn't going well. Whether I was stressed about schoolwork during senior year of college, had a falling out with a friend, was homesick when I lived in Vermont... my #1 coping technique was to start swiping and find a date to distract me! A distraction is 100% not the purpose of healthy dating relationship, but having easy access to apps would make me forget that in the moment. These days, I have much healthier coping mechanisms when I've had a bad day, none of which involve male attention. *Being less competitive with other women and myself: I'm no stranger in falling victim to the comparison trap, especially about dating and relationships. It was a desire of my heart for such a long time to meet my "person" early in life, and although that didn't happen for me, it did for many of my friends! Instead of being genuinely happy for those who found love sooner, I found myself jealous, and that being on dating apps just fueled that. Then there were the circumstances of comparing myself to other friends who used apps! I'd taunt myself with internal questions like Are her pictures in her bio better than mine? Why is she getting better dates or more messages? How could she find a boyfriend on Tinder when I just found guys I had no connection with? For me, getting off dating apps was not only a time to be happy in singleness and actually enjoy it, but also to stop comparing my love life with that of my friends, and just be happy for them! After reading this, you might think that I've done a total shift in thinking, and now consider dating apps to be evil or something. I most certainly don't! I have many friends and even more acquaintances who have met their boyfriends, or even husbands from dating apps, and are in healthy and loving relationships from meeting this way. But for each person I know who had a dating app success story, I know even more like myself who they didn't work out for. It really depends a lot on the location you're using them in, and even more than that, luck! You might find Mr. Right on the first swipe, or you might never find him on an app. Overall, I found through my own experience that using dating apps felt very selfish, and pulled me further away from my relationship with the Lord. Instead of being content and grateful for all of the blessings I have in my life, it helped me to fixate on something I didn't have. And a fixation can become an obsession if you aren't careful! For the record - just because I've sworn of dating apps in 2018 doesn't mean at all that I've sworn off dating! I have still gone out on dates with a few people since I quit apps. None of the guys I've met in the last year have turned into something serious, but I've found the dating process when you meet through other means to be a lot less stressful, and just feel all around more natural. So for my final thoughts on dating apps- I don't regret trying them in college! I think I would have always wondered what it would have been like if I'd never downloaded a couple apps and been on a few dates. What I do regret is using them for as long as I did. I think after like the third guy that I met from an app (where it was a similar situation to the first two guys of there not being as much chemistry in person), I should have deleted them at that point, and not stayed on for another year or longer! You can't keep trying to force something that's not meant to be. I also think there is some merit to trying them either for the first time or again if you've just moved somewhere new. Using Bumble in Vermont actually helped to solidify for me that Vermont was not the place that I wanted to live longterm or settle down- lol! What are my plans for dating apps in the future? Still not even thinking about them until 2019. 😊 Once the new year is here, I have a feeling I'll still away from them for a bit! Stay off them forever? Maybe, maybe not. Who knows what the future holds! But for right now, I am very content with my full life: my day job in radio, blogging as my side hustle, my friends, my faith and my church, and all of the hobbies I enjoy like cooking, reading, and traveling when I can. My life is blessed and busy, and while a serious relationship would be great right now, I want it to happen naturally, not because I spent a few hours swiping through pictures of random guys. I've always prayed to have an amazing story to someday tell about how I met my husband! Personally- meeting someone on a dating app, or really anywhere online isn't my idea of a great beginning to a love story, at least not right now. I always love hearing y'all's thoughts on my Relationship Monday posts- so please sound off in the comments! You made so many great points in this post. I never used dating apps, as they were a little before my time. But I can see the down sides to them. I am loving this post! I have such a love/hate relationship with dating apps and I think my thoughts would totally mimic yours if I were to get off of them for a year! Especially the part about less competition with other woman and being more content with being single. Such a great post! That's one of the most common dating advice questions women have. The calling rules as they relate to men can get a bit confusing.